An interesting phenomena has been observed in the wake of Hurricane Irma as it moves along the west Florida coastline. Several images have been put on social media of water drastically receding away from the coastline, whereas tropical storms usually result in surge as they make landfall. This phenomenon is largely due to 2 factors. First, the winds ahead of Irma are westward and offshore. This has the effect of pushing water offshore. 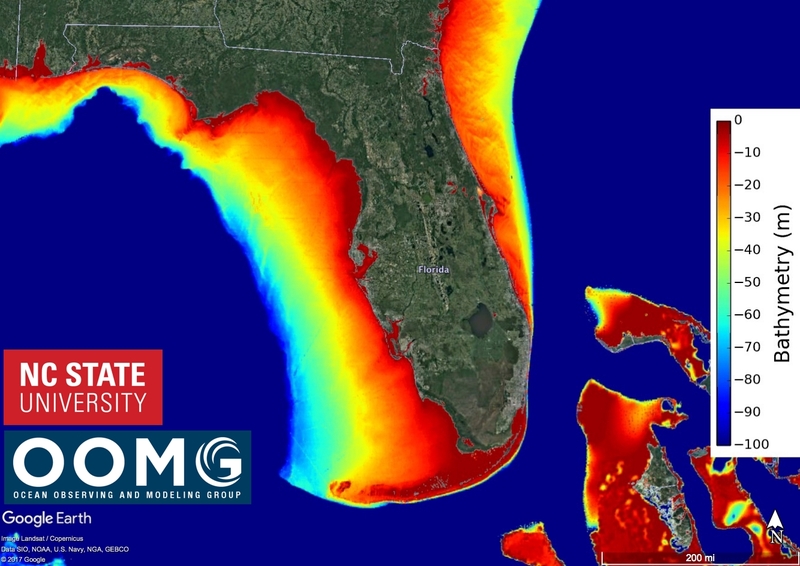 Second, the bathymetry on the West Florida Shelf is characterized by shallow sloping, meaning that a 1 or 2 meter decrease in sea level would result in long stretches of dry seabed. As this is dynamically driven, it can be observed in our CNAPS model. The included animation shows offshore winds in advance of Irma’s eye which quickly whip around to onshore. Offshore winds result in a modeled 2+ meter decrease in sea level, but once the eye passes, sea level rises with a combination of returning coastal water and storm surge. The National Hurricane Center has been sending out dire warnings to people in the path of the returning surge to stay away temporarily dry seabeds. Further up the coast, in Tampa Bay, water levels are rising rapidly and surge is already exceeding the Mean Higher High Water (MHHW) levels. Original text taken from the Ocean Observing and Modeling Group (OOMG) blog. Update: Parts of this story were published on Sept. 12th in the scientific blog Live Science.